When it comes to good restaurants and great food, my little hometown of Kenly, NC leaves a lot to be desired. Don’t get me wrong – there are options available, and I love living in a small town. But unless you’re craving fast food, barbeque, or pizza, you’re out of luck in Kenly. For more on reviews in the Triangle area access this resource: North Carolina Triangle Reviews. I find myself visiting the nearby town of Smithfield, NC often, for this reason and more. Smithfield is far from a metropolis, but it does have a wider variety of dining options, many of which are independently owned. Considering my sister had dance camp in Smithfield every night last week (which left me with around three hours to kill each night), I had plenty of opportunities to explore what the town had to offer. My mother and I normally end up dining at places like Outback Steakhouse or Zaxby’s while we wait on my sister to finish up at dance, but towards the end of the week, we were both sick of the usual and ready to try something new. As we mulled over the options and tried to decide on a restaurant, we both considered the many glowing recommendations we had received from friends to try Heidi’s Two-Wheel Café. We had heard all about how wonderful the food was, and one friend even went as far as to tell us that, “if you haven’t eaten here yet, you’re missing out on the best place in Smithfield”. We figured that there was no time like the present to give it a shot. Heidi’s Two-Wheel Café is located on West Market Street in Smithfield, in a building that was a Pizza Hut in another day and age. The exterior of the restaurant is simple and understated, and if you weren’t aware of the place already, it would be easy to drive by without noticing it. The restaurant features both indoor and outdoor seating. There are two outdoor seating areas – a covered portion with several tables, and an open area at the back of the restaurant with picnic tables. According to Heidi’s business Facebook page, it is a self-described soul food diner and seafood restaurant. 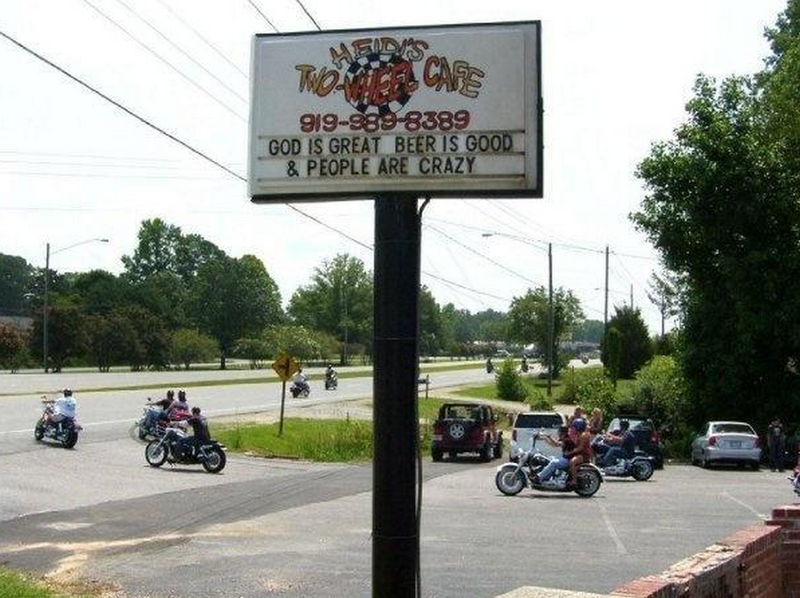 As the name implies, Heidi’s caters to motorcyclists, and has multiple parking spots for bikes. We decided to dine indoors to avoid the heat. The interior of the restaurant is small but cozy, with a total of about six booths and six tables, as well as seating at the bar. As far as interior design, it’s clear that the restaurant is meant to look more comfortable and simple rather than like a five-star dining establishment. It features wall-to-wall wood paneling, adornments such as neon signs and a buck head mounted on the wall, and, of course, an electronic jukebox. It was also easy to see that Heidi has her regulars – there were several men and women there who appeared to be right at home. Overall, I enjoyed the whole feel of the place – it almost felt like dining in the living room of a close friend. When we arrived around 6:15 PM, there were very few indoor tables available and the bar was full. Once we had seated ourselves, we were waited upon by no other than Heidi herself. She was helpful in describing the menu options to us, as we were having trouble deciding on something – everything looked delicious! There were multiple choices for appetizers, including fried zucchini, mac n’ cheese bites, buffalo chicken dip, and boneless wings. The main entrée menu featured a lot of variety as well. Several different salads were on the menu (labeled as “rabbit food”), but what drew our attention the most was the burger selection, which included classic burgers, mushroom swiss burgers, and more. I’m strictly going off of memory here, as Heidi’s menu is not available online, so rest assured that there were several more options than what I’ve listed here! All of the burger choices looked delicious. There was also a wide selection of sandwiches, such as a buffalo chicken sandwich and a Philly cheesesteak. Heidi’s also offers several seafood dishes, including steamed shrimp and oysters. In fact, the Dish of the Day was a fried scallop plate with homemade French fries. When we go back to Heidi’s, I will definitely try the seafood, as I have heard nothing but great things about it. It was tough making a decision, but my mom and I both ended up ordering the same thing: the “Snooze-Button Burger”, which is topped with American cheese, bacon, and a fried egg, and served on Texas Toast, as well as the buffalo chicken dip appetizer. The appetizer was an excellent choice. The buffalo chicken dip itself was very good, with just the right amount of spice, but there was nothing inherently special about it – in fact, I’ve made something similar myself many times. The best part about the appetizer was what was served with it – “fried” tortilla pieces, which were absolutely delicious. While they may sound like a simple side item, they made the entire appetizer, in my opinion. In essence, they were simple – I believe they were just flour tortillas, cut into triangle-shaped chips and deep-fried. But they had just the right amount of crunch, and were a pleasing and surprising deviation from the usual corn tortilla chips that are usually served with a dip like this. I would definitely order it again. After devouring the dip (which was a generous portion size), my mom and I found that we could have easily split a burger and still have been more than satisfied. The burger arrived steaming hot – in fact, I had to wait several minutes for it to cool. I ordered the pub chips with homemade ranch as my side, whereas my mom ordered the beer-battered onion rings as hers. Both of them were delicious, though I preferred the hot and crispy onion rings. The burger itself did not disappoint – it was juicy and seasoned well, and there was no question as to whether it was real hamburger meat or not (which, sadly, is not the case at all restaurants these days). The Texas Toast was another pleasing twist from the standard burger bun. While I could only eat half of my meal before I was stuffed, I thoroughly enjoyed it. Sadly, I cannot attest to Heidi’s drink selection, as I’m four months away from being able to legally enjoy one. I’ve heard that they have quite the selection of beers on tap. However, I can say with confidence that they have a good glass of sweet tea! The prices at Heidi’s are also worth mentioning, as I found them to be very reasonable. My mother and I both dined for around $32, which included an appetizer, two entrees, and two drinks. Those prices are definitely competitive with other restaurants within the area. When you flip to the back of the menu at Heidi’s, there are several pieces of information about the restaurant itself. First, there is a humorous warning to all parents – feel free to bring your children, but be aware of what time you are coming and what company may be around, as that may affect what your child sees and hears. There were other kids dining at the same time as us, but considering the bar is in such close proximity to the rest of the indoor seating area, I can understand that parents may want to take caution in bringing their children to the restaurant at 10 PM. In my opinion, this is a smart business move. Believe it or not, there are actually very few bars in the Smithfield area. While they may not exclusively market themselves as a family restaurant, Heidi’s is catering to a wider audience by looking out for all types of people. Let me put it this way – I would have no qualms about taking my thirteen-year-old sister to Heidi’s to grab lunch or an early dinner. 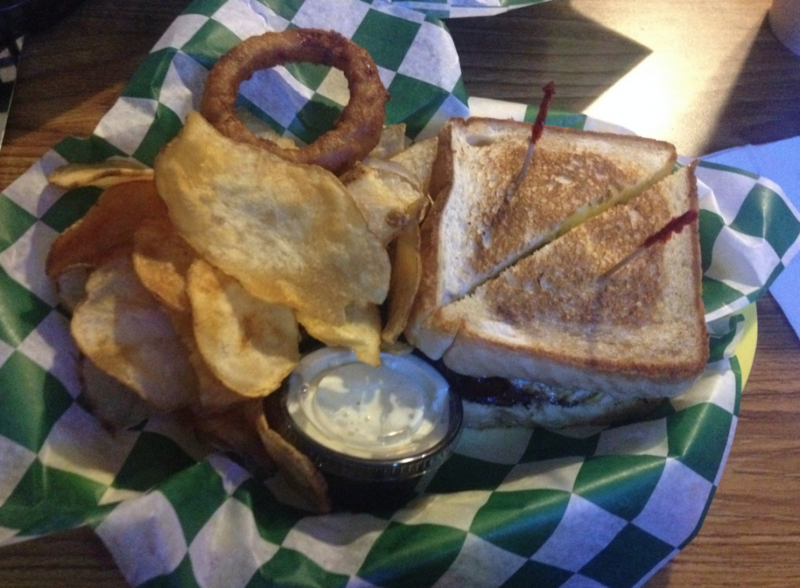 Another piece of advice on the menu is this: Heidi’s serves good food, not necessarily fast food. All dishes are prepared upon order, so that each customer can count on a fresh meal. As Heidi herself said on her business’s Facebook page, “I opened the doors with no intentions of selling you mediocre food that’s been sitting around getting sad under some forgotten heat-lamp so you could be in and out the door, unsatisfied, in 20 minutes.” And these aren’t empty words – as stated before, every single dish that came to our table was piping hot. We ended up staying at Heidi’s for around an hour and fifteen minutes, which was no problem, considering we were in no hurry. However, this is not a place that you could swing in on your lunch break and be in and out in thirty minutes. In my opinion, though, it’s worth sacrificing a little bit of your time in return for high-quality food. Overall, I thoroughly enjoyed my experience at Heidi’s and I feel sure that I will be back very soon. The food was delicious and well priced, the atmosphere was fun, and the service was excellent. I am glad that I heard about Heidi’s through word-of-mouth, because otherwise I highly doubt that I would have given it a shot. Other than a short feature on UNC-TV’s NC Weekend, Heidi’s Two-Wheel Café has relied on word-of-mouth marketing to get new customers. I feel sure that if Heidi’s invested in building up a strong online presence through social media or a website with plenty of content, they would witness a huge boom in business. How Student Newspapers and Magazines Go Viral on College Campuses | Is Pinterest Good For SEO and Google Search?